A chamomile lawn remains a delight to us all, especially at this time of the year when it’s in flower. Well worth attempting at home provided you have full sun and good quality soil. 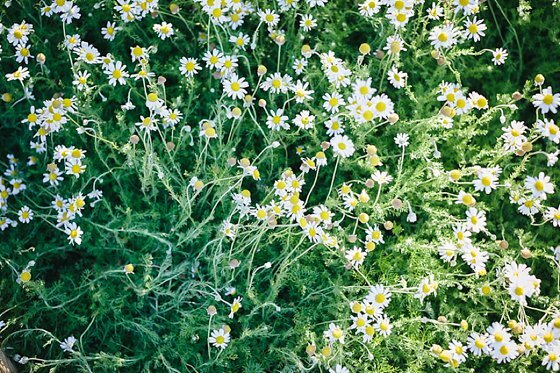 We created a perennial lawn of Roman chamomile (Chamaemelum nobile / Anthemis nobile) that has medicinal properties similar to the annual, as well as the somewhat better known German chamomile (Matricaria reticulata). The former’s flowers are slightly more astringent compared to German chamomile. About five blossoms to a cup will soothe you as a sedative, antispasmodic and anti-inflammatory aid. Here’s how we did it: Prepared our soil as for an ordinary lawn, adding compost and chicken manure, as well as a dash of bone meal with a layer of lawn dressing on top to allow levelling. The plants were propagated as plugs by Bridget Kitley. These were planted as tightly as possible (about 15cm) to close out weeding until they are properly knitted into a lawn. House-tame husbands will be happy to hear that a chamomile lawn is low maintenance, only needing one mowing after the flowers have bloomed. Weeding is required a few times a year, and watering would be the same as for ordinary grass. A relaxing barefoot walk on the chamomile lawn is part our daily garden tours. For bookings and enquiries please phone (021) 863 3852 or email enquiries@babylonstoren.com. Thank you for the beautiful tip for an alternative lawn. I’m battling with a Kikuyu grass lawn, which I inherited unfortunately, and am looking for alternative ground cover. My New Year’s resolution is to remove this alien invasive, but would prefer to replace it with an indigenous plant species. 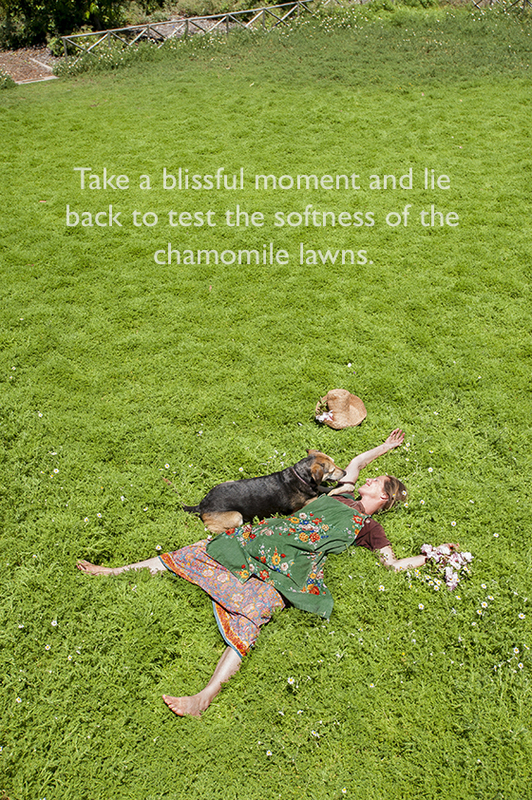 Do you think a Chamomile lawn is the way to go? New Year’s resolutions must not be left unattended, so I’d like to encourage you with this one. I implemented the gardening of the public open spaces at Schonenberg before coming to Babylonstoren, I know the challenges you’re facing, well. Some of the lower properties get badly waterlogged in winter and for those I would suggest Monopsis lutea and Falkia repens. Unfortunately the Chamomilis nobilis is not indigenous, but in the meadow diagonally opposite, we have planted an indigenous type of camomile that is a pioneer plant in fynbos. Lasciospermum was included in the original “meadow-mix” sowing at Schonenberg, but I wouldn’t know how much the maintenance allowed for its flourishing. Like all pioneers, its fast and can take over rapidly, but short living. A biannual that selfseeds so readily that its easy to keep it as a wild meadow, but needs to be rolled flat once a month to make for a well knitted carpet. If there is not too much heavy passing of feet, I’d suggest one of my favourites; Otholobium decumbens. Does well in full sun and semi-shade with the same cool calm green colour of a lawn. Grows to about 10-15cm, no mowing required. Dimondia is always suggested for hot and dry conditions and will grow as a very flat (5cm) hard wearing ground cover. It is silver in colour, so it helps if your surrounding garden is green and lush to frame the lawn. I planted a small lawn of Dimondia for Norman and Wanda (tel: 021 8522 704) in Schonenberg 7 years ago, he would be happy to share his experience with you. Otherwise you are welcome to view the mix of indigenous ground covers I have experimented with between our guest houses and vineyards. Brings back beautiful, happy memories of lying there. Definitely want to do this. Thank you for the info. Do the bees like this lawn as much as we do? The love it, but love the thyme lawn even more! where can one buy the chamomile plant from ??? We got ours from Bridget Kitley Herb Nursery in Stellenbosch. It’s not as easy to come by as the German Chamomile. How expensive is it please?? Sigh, the lawn looks exquisite. I have a smallish garden, 2 dogs and 2 kids (2 years and 8 months old). I assume it wouldn’t be the greatest idea for me at this stage considering the kids still put ‘everything’ in their mouths?? As for the dogs when they have funny tummies and eat grass, would this be OK for them if it was their only option? And would I be wasting my time due to dogs and kids trampling all over the garden? Hi Siphiwe, our herb workshop in unfortunately already fully booked for this year. Please keep a look out on our website for the next one we will be hosting next year. – you said to trim the first flowers? I read that the flowers contain seeds so will the flowers not help it self sow? – I’m going to plant from seed because my garden is 40 square metres which would mean a lot of plugs. Can I just broadcast the seeds or do I plant them like the plugs 15cm apart? Thanks in advance, the questions may be stupid but I’m an amateur and could use all the help I can get.